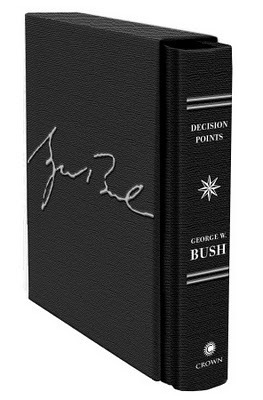 Booktryst's controversial report about the limited edition of former President George W. Bush's new book, Decision Points, has been vindicated by new facts that have emerged since its original publication. The "limitation" is to a staggering 4,500 copies, a number so large that the edition has lost all credibility as a collectible and claim to being special. "Crown initially planned a print run of 1,000 copies of the limited edition, but subsequently raised the print run to a total of 4,500 copies in order not to disappoint consumers. There will be no additional printings of the limited edition. I can assure you that it is was never our intention to mislead consumers or collectors. In April of this year, we announced that a print run of 1,000 copies was planned, but there were a great number of consumers who expressed disappointment at not being able to purchase a copy and we sought to accommodate them." Let me assure everyone that a print run of 4,500 is not a "limited edition." It is, in reality, close to the average print run for any new, trade (standard) edition book by a non-celebrity. If there was no intention to mislead consumers or collectors why didn't the publisher state the reality on its website? And the lack of a limitation statement in the book declaring the number of copies in the edition is a huge caveat emptor/collector. A truly collectible limited edition book always states the number of copies printed. Once again, this is not a viable book from a collecting point of view. It will never become rare. And it is unlikely to ever appreciate in value; indeed, with 4,500 copies in circulation the aftermarket for the book will likely declne. $350 for the limited edition? Buyers are being stiffed. It harkens back to the days when a limited edition of a clandestinely published book was limited only by the number of copies the publisher could sell. It was a racket. By not wanting to "disappoint consumers" Crown has betrayed them. They've sullied the rare book collectibles market with this nonsense, attracting naive or budding collectors who are now, once burned, likely wary of book collecting as a hobby. By marketing it as a "collectible," over-selling it without any update to their original announcement, and omitting any mention of the limitation number on the limitation page (because the limitation leaves were pre-printed, signed by President Bush, and then inserted into the already-bound book), the publisher has doomed it as a collectible; it will never have any appreciable market value. Nice work, Crown. You've won Booktryst's 1st Annual Travesty Collectible Book Award. N.B. : Once again, I remind readers that we have confined our commentary strictly to the book as a collectible and not to politics in any way. If you've bought the limited edition because it has meaning to you, you've not done wrong; it is why people collect books and we encourage that. But in the future, sooner or later, copies in very fine (mint) condition of the limited edition of Decision Points will be selling for $75, tops. There are just too many of them. 12/03/2010 UPDATE: Crown Offers Refund to Disappointed Decision Points "Limited" Edition Buyers. 12/16/2010 UPDATE: Legal Action Begins Against Crown/Decision Points Limited Edition. Is this the least limited 'limited edition' ever? It's sad that you have to put in the disclaimer: "Once again, I remind readers that we have confined our commentary strictly to the book as a collectible and not to politics in any way." in an otherwise enlightening and informative article. XIT Being a New and Original Exploration, in Art and Words, into rhe Life and Times of the American Cowboy. by Caleb Pirtle, published by Oxmoor Press, 1975. Signed and numbered "limited" edition of 50,000 copies. Has it been confirmed that GWB is even hand signing these, or just running them under his autopen? Most consumers have no clue what constitutes a "collectible" in any case. Go into a Friends of the Library bookstore, and you'll often see raised prices under the misunderstanding that a stated First Edition is automatically worth more; whether the author is a James Patterson or a James Joyce makes no difference. The average consumer believes in truth in advertising, and that a book that is signed, stated First Edition, stated Collectible or otherwise marked as special is therefore valued more, regardless of the aftermarket reality. Such a shame that Crown is exploiting this ignorance. I appreciate the commentary. I was one of those who purchased this book through B&N.com and only paid about $250 for it on sale (still a pretty penny). While I admit I was a little surprised to see No. 4225 on the inside, I do not regret my choice nor do I ever intend to sell it. I still think though that in 50 years' time this will be worth exponentially more than it is now. We are completely dismayed that the most honest president since George Washington owned up to the cherry tree (who else has admitted in writing to authorizing torture?) has been so treated by his publisher. We are certain that Mr. Bush had no hand (though perhaps an autopen) in this fraud. I still think with millions of Americans who would like a book like this. 4500 is till a small number. If they sell for 75.00...I'd buy them up! I like the edition. Is it really "hand signed"? I wouldn't read this book (collectable or not),if it was given to me free of charge! Who wants to read what this "man" has written? What is his legacy? Unwinnable wars and destructive debt? There are so very many better books to read!! Very generous of Crown not to "disappoint consumers." (Consumers, not readers!) I take it they didn't lower the price of their expanded "limited" edition, so as not to disappoint themselves as well. I'm waiting for the pop-up version for his true fans.